September’s average temperature was slightly below normal due to cool upper-level troughs which dominated the inter-mountain region for most of the month. Highs were only the 60s on six days. The high of 63°F on the 14th was the coolest day since June 15. 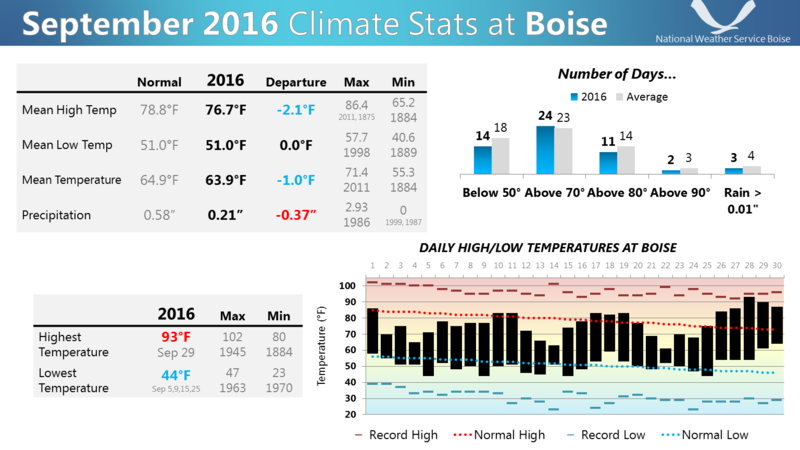 A very warm upper-level ridge built over the region on the 25th and 26th, bringing Boise the highest temperatures of the month. The 93°F on the 28th was only two degrees shy of the record for that date. As the ridge moved east on the 29th and 30th, southwest flow aloft on its western flank, combined with southeast surface winds, continued the warm weather. Precipitation was one third of normal. For most of the month, Boise was on the western margin of moist air moving up from the south, so upper-level troughs interacting with this moisture dumped most of their rain on south-central and southeast Idaho. Locations east of Boise received substantial monthly precipitation totals, ranging from just under an inch at Mountain Home to over two inches at Twin Falls and Pocatello, much of that from the 21st through the 23rd.